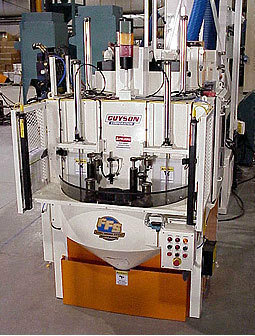 For 360-degree impact treatment, an indexing table system with rotary spindles is one of the most popular types, and Guyson RXS-series blast machines are available in a variety of cabinet sizes with from 2 to 12 or more spindles for high speed and high volume processing. In RXS-series systems, the fixtured components are presented to the blast from multiple guns as the part revolves at controlled speed on a sealed ball bearing spindle. The blast nozzles may be bracketed in fixed position at the correct angles and distances for coverage of target surfaces, or they can oscillate or traverse to conserve costly compressed air. In our RXS-900 and larger systems, there can be 2 or more blast stations within the cabinet, so a brisk cycle time can be maintained even when many component surfaces must be blasted. Looking to Purchase a New GUYSON RXS-900? Looking for a USED RXS-900?Have one to sell?